Since starting out in my freelance body painting career in 2004 I’ve worked on some amazing assignments in some beautiful locations. Some of these jobs have had very tight schedules and it’s literally been fly in, paint, and fly out! 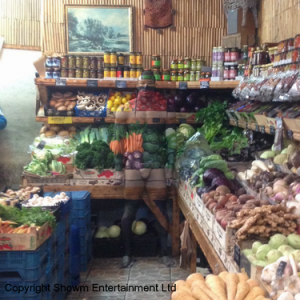 But luckily, most of the long haul destination jobs have included some spare time to get out and about for some sightseeing, trying the local food and of course buying some local souvenirs! That definitely makes the jet lag worth it. Although my husband might disagree as he sees yet another coconut shell drinking cup, raffia hat and heavily embroidered stuffed animal emerge from my suitcase! I’m very lucky to have worked with clients in Hong Kong, New York, Las Vegas, Chicago, Atlanta, New Orleans, Orlando, Cape Town, Thailand, South Korea, The Dominican Republic, Mumbai, Paris, Holland, Belgium, Austria, Berlin, Alicante, Rome, Gran Canaria, Latvia, Nuremberg, Monaco and Malta. A lot of my work comes in with reasonably short notice and some of these destinations have required visas. So it’s usually a race against time and an anxious wait to get all the paper work approved in time for me to fly out! Below are some of my favourite assignments. I’ve been very lucky to visit Las Vegas 3 times and this is definitely one of my very favourite destinations. The first visit was incredibly memorable. 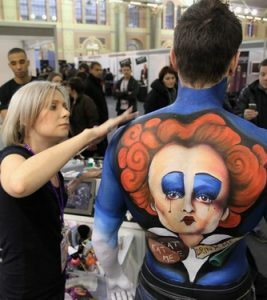 I was invited to teach at the 2011 Face Painting and Body Art Convention by the organiser the lovely Karen Owens. At the end of a long flight seeing the outline of the skyscrapers of the Las Vegas strip peeping out from the desert as the plane approached the airport was a surreal experience. Once I had collected my suitcase from baggage I was met by a chauffeur and whisked off in a white stretch limousine, courtesy of Karen, to the beautiful Flamingo Hotel. So it was definitely a ‘Welcome to Las Vegas’ moment! The convention was brilliant with so many friendly people and I returned to teach again the following year. My third visit was in 2015 when I painted at a make-up artist trade show representing the ‘Olivares Haus of Glam’. Another very beautiful location was South Africa where I’ve worked on 2 assignments in Cape Town. The first one was in 2009 when I was body painting for a series of fine art prints for Storm Thorgerson, including ‘The Beach Catalogue’ and ‘The Outback Catalogue’. In between the painting there was plenty of free time for getting out and about sightseeing and visiting the local markets. The second trip was in 2010 when I was commissioned by H2 Films to camouflage a model into various locations for an advertisement for ‘The Irish National Lottery’. Cape Town is amazing I loved the scenery and the culture and it’s definitely on my list of places to re-visit purely as a tourist without a paint brush in my hand! On New Year’s Day in 2012 I escaped the British winter weather and travelled to India with the great team from Acrobat Productions. I was commissioned to do the face and body art for the performers who would be working at a prestigious wedding in Mumbai. We stayed at the beautiful Trident Hotel and after the job we all had a few days to relax and see more of this fascinating city before we flew back to London. I loved India and it’s definitely a country that I would like to return to sometime in the future. Back in 2012 there was another memorable campaign that I had the pleasure of working on. It was a television advertisement for the Belgian travel agency ‘Neckermann’. The idyllic location for the filming was The Dominican Republic in the Caribbean. Our long-haul destination involved planes trains and automobiles before we reached our hotel, which was the base for the filming. My job was to camouflage several models into tropical looking backdrops so I took along my Getmadeup team mate Emily Dowdeswell to help with the painting. We had a fantastic week working with the models and managed to fit in some shopping in our free time…. yet more souvenirs in the suitcase! I’ve visited ‘The Big Apple’ 3 times and it’s always a pleasure! 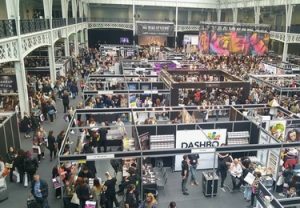 I’ve demonstrated make-up and body painting at various industry trade shows in this great city! In 2008 I represented Mehron at ‘The Make-up Show’. 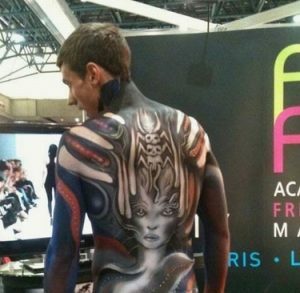 In 2011 I painted for AOFM at ‘IMATS’ NYC and my last visit was in 2015 when I was commissioned to paint for ‘Olivares Haus of Glam’. There’s usually been enough spare time for me to get out and about in between the painting to shop until I drop! As I’ve previously mentioned in an earlier blog, for a successful career as a commercial body artist versatility is key! You have to be confident that you can paint in any style that your client requires, whether it be logos, tattoos or camouflage body painting. And although very well known for my camouflage work, one of my particular favourites is painting 3 dimensional and illusion designs. I love the way that you can create something so different from the norm and really trick the eye using only body paint. In 2014 I represented Mistair at the Olympia Beauty show which is one of the UK’s best trade events in the beauty industry. Held annually at Olympia in London the show attracts salon and spa owners, make-up artists, nail technicians and students. There are numerous demonstrations taking place during the event including several student competitions. I painted model Laurence Caird with a 3-dimensional design inspired by the work of tattoo artist Jesse Rix. I also gave a talk during the show about ‘Commercial Body Painting as a Career’ and one of the prizes awarded by Mistair in the student body painting competition was an industry day with yours truly! The finished design on Laurence is one of my all-time favourites and was a huge hit on my Instagram page, where it’s racked up more than 1,000 ‘likes’. 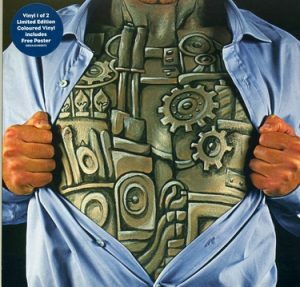 I’ve done quite a bit of body painting over the years for the late great Storm Thorgerson, the artistic genius behind numerous iconic album covers including Pink Floyd and Led Zeppelin. One of the designs that I really enjoyed working on was back in 2007 and was for the 4th single from the album ‘Puzzle’ which was entitled ‘Machines’ by the Scottish rock band ‘Biffy Clyro’. There were a series of body painted images for the album and subsequent singles. For ‘Machines’ I painted the model with Storm’s design of a metallic torso showing beneath the model’s shirt. The photography is by Storm Studios photographer Rupert Truman. 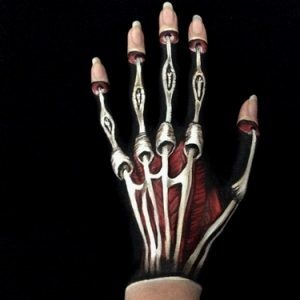 Another real favourite of mine is the hand that I painted with an illusional terminator style. Last year I started my own Youtube channel and made several time lapse videos featuring 3 dimensional body paintings, superheroes and various other designs. For this time lapse I painted my own hand and I think it worked out particularly well. I really like the end of the video where my hand takes on a creepy life of its own! This image has also been a big hit on my Instagram page with more than 800 ‘likes’. Another body painting that I designed for my Youtube channel was a 3 dimensional chain link that I painted on my friend and model Liam Boyle. I made a time lapse video that demonstrated the use of highlighting and shadows that really makes the chains stand out and look as if they’re literally hanging down the front of Liam’s torso. This was another Instagram favourite with more than a 1000 ‘likes’. I’m really looking forward to putting together more time lapse videos, but I’ve been so busy with commercial work recently that my filming fun has had to take a bit of a back seat for now. Way back in 2007 I was asked to submit some images for an article on my body painting that ‘Illusion’ (the face and body art magazine) was putting together. They requested previously unpublished photos. Most of my work is commercial and has already been shown in either newspapers or magazines, or on bill boards around London. So I got together with my photographer friend Joseph Sinclair and designed some new images especially for the magazine. One of the new designs was the metallic neck effect that I painted on model Stephan D’Bart. 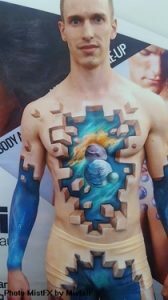 This was my first illusional body painting and I think it worked out really well. 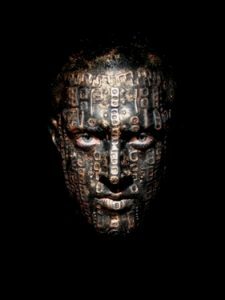 Another design that I created back in 2007 for Illusion magazine was a 3 dimensional face painting. This was originally inspired by a piece of work that I found in one of my art books by the Swiss surrealist artist H.R. Giger. I made tiny shapes from liquid latex and attached them to the model Sam’s face with spirit gum. Then I painted him with black face paint before finally adding a touch of gold paint to bring out the detail on the latex pieces. The photography was by Hass Idriss. I also painted an illusional design at IMATS (International Make-up Artists Trade Show) held at Olympia Exhibition Centre in London in June. I was delighted to be commissioned to paint on the Screenface London stand. Screenface is an amazing supplier of all things make-up and body art related, and Screenface products have been used in numerous films over the last 30 years including Monty Python, Harry Potter and Indiana Jones. For the demonstration I painted my great model Kyle James, again using lots of highlights and shadows in my design to show metallic parts and torn flesh. Kyle had to step in at the last minute, but I think you’ll agree that he proved to be a marvellous living canvas for my design. You can read more about IMATS in general, in one of my earlier blogs. The IMATS Show in London, 2016. 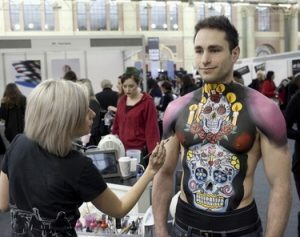 The International Make-Up Artist Trade Show (IMATS) features professional make-up and body painting in annual events covering four countries. Since the first show in Los Angeles in 1997 IMATS, founded by Emmy Award winning make-up artist Michael Key, has now expanded and there are trade shows in New York, Los Angeles, London, Toronto, Vancouver and Sydney. This 3-day event is the world of make-up’s biggest gathering of make-up artists, students and industry enthusiasts all under one roof. Top professional artists often from the world of film and TV, and SFX experts, give demonstrations and hold seminars which gives the visitor a fantastic opportunity to hear first- hand the experiences of the very highly regarded professionals working in this fascinating and very diverse industry. There’s a whole host of exhibitors selling everything that you could possibly need for a career in make-up and/or body painting. When I was a student doing my HND in Specialist Hair and Make-up at West Thames College a trip to London IMATS was definitely one of the highlights of the year. Listening to the seminars from my heroes in the world of make-up. Seeing the incredible SFX demonstrations and creations, watching the professionals at work at the various make-up booths, plus getting the opportunity to see, and try out, so many fabulous products was pretty mind blowing for a young student. I always left at the end of the day with my bag full of new brushes and beautiful products, a head buzzing with inspiration, sore feet, glittery bits everywhere and a large dent in my bank balance. Since 2004 when I started out as a freelance make-up and body artist I’ve worked at IMATS several times both in London and New York representing various teaching academies and make-up and body art companies. This year I was delighted to be asked to demonstrate for Screenface London. 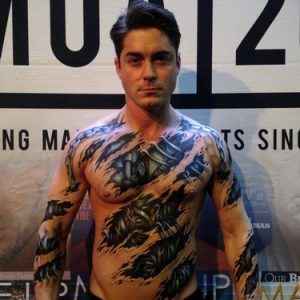 Below are some of my favourite designs from my body painting in past shows including my illusional design painted at this year’s show in London on Saturday the 4th of June. My first booking at IMATS London was for The Academy of Freelance Make-up Artists (AOFM) back in 2010. I took my inspiration for the design from the beautiful work of Polish Art Deco artist Tamara de Lempicka 1898-1980. My model, Armin Grossegger, flew in from Austria especially for the event. Once I had finished the painting I embellished the design with peacock feathers, crystals and superfine glitter. The following year I painted for AOFM again. At the London show in January in 2011 I used the amazing work of the Swiss surrealist artist H R Giger for my inspiration. 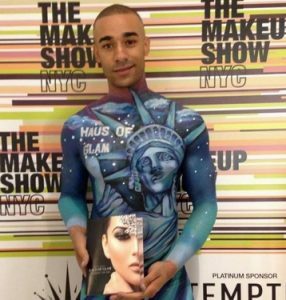 Then in April I hopped across the pond and represented AOFM at the IMATS show in New York. This time I decided on a series of Superhero images for my paintings. In 2012 I was back in London and represented Mistair. MistFX face and body paint was quite a new product on the market and very different to other paints that I had used in the past. Unlike the solid paints that are activated with water, MistFX is a liquid paint and comes in a bottle. It comes in a great range of colours, it’s very durable and gives a really lovely professional finish. I decanted the paint from the bottle into an artist’s pallet and painted my brilliant model with a very colourful sugar skulls design. On the second day I painted a design inspired by Helena Bonham Carter as the Red Queen from the 2010 film ‘Alice in Wonderland’. I was really pleased with how it turned out and this has always been one of my favourite pieces of work. In 2013 I painted for Mistair again and this time the Superhero theme made a re-appearance. My husband is a huge fan of anything Marvel related and we’ve got shelves full of books and comics which are always a great source of inspiration for me. My model Ryan Mackins was huge. I think he must hold the record for the tallest person that I’ve ever painted! I was delighted to be commissioned by Screenface London to paint at their stand at this year’s show. We had a last minute panic when the model who had been booked broke his leg the night before the show. After several frantic phone calls, Paintopia director Jennie Roberts arranged for the brilliant Kyle James to step in and save the day. Kyle was an absolute delight to work with and I decided to accentuate his great physique with a design made up of a combination of ripped skin and metal inner workings with a bit of flesh showing through for good measure!! IMATS exhibitors include numerous high profile brands from the world of make-up, SFX and body painting; also make-up magazines, colleges and brush companies. The wide range and quality of the products, the artist demonstrations, the student competitions, plus the seminars, makes IMATS a must for anyone interested in the industry, or for those already working as a make-up artist or body painter. Just wear some comfortable shoes and take along a purse full of money! You’ll be tempted beyond belief and already planning your visit the following year! The Royal British Legion is the nations’ biggest Armed Forces charity providing care and support to all members of the British Armed Forces past and present and their families. I was delighted and very proud to work on the ‘Count Them In’ campaign launched on the 16th of May 2016 which calls for the Armed Forces community to be recorded in the next UK census in 2021. At the moment there’s very limited information about where they are, or what their needs might be. 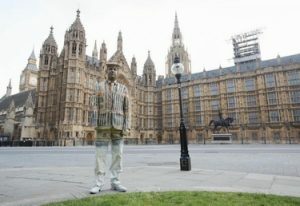 So I was commissioned to camouflage 4 veterans using body paint into different locations around the UK to highlight the fact that they are currently invisible in the census amongst the general population. All the veterans would be wearing a full set of clothing for the camouflage painting. 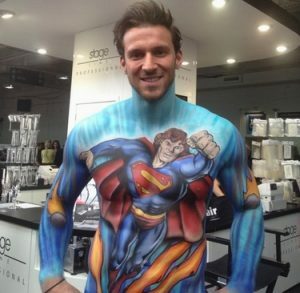 This is much more difficult than a straightforward body painting on a model wearing only underwear. Clothing has folds and creases and has a tendency to move around, then any line work or details won’t match the original background. I was also aware that the painting would have to be done as quickly as possible, so I enlisted the help of my fellow artist and member of my Getmadeup team Laura Scimone to speed up the painting time. Our first location was The Portico Library in Manchester. Laura and I hopped on a train from London to Manchester where we met up with and painted the lovely Frank Simpson, aged 61, from Salford. Frank had been in the Army since 1969 and was medically retired in 1985. Despite his health issues he was a fantastic model and great fun to chat with during the painting. Our second marvellous model was 31 year old David Iveson who served as a Lance Corporal and completed 2 tours of Iraq. Unfortunately David injured his back whilst on duty in 2005 and has never recovered. 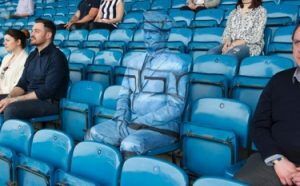 So Laura and I set off on the train, this time to Cardiff to camouflage David into the seating area at Cardiff Arms Park rugby ground. Again David was fantastic to work with. Once we had finished painting Laura and I stayed overnight in Cardiff as we needed to be on a very early train to Plymouth the next day. So the following morning we were up and about at the crack of dawn and back on the train for our trip from Cardiff to Plymouth to paint our third model Mike Jarvis. Mike had previously served in the Royal Navy and we met up with him at the Boston Tea Party Café. 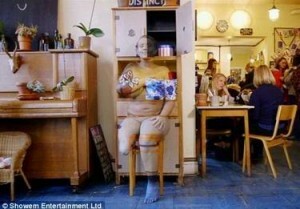 We camouflaged Mike as he sat at a table in the café to highlight his invisibility on the current census. Our final painting was planned for the day of the campaign launch on the 16th of May. We needed to get the painting finished for a 9 a.m. press call, so that meant setting my alarm at 3.20 a.m. We would need to be up and at the location ready to commence the painting at around 5 a.m. We met up with our final fantastic model Darren Fuller outside the Houses of Parliament. Darren served for 20 years in the 2nd Battalion Parachute Regiment. He was medically discharged in 2014 after losing his lower right arm during a tour of Afghanistan in 2008. This final location was definitely one of the most challenging from a body painting point of view. It was pretty cold and blowy when we started, and semi dark so hard to see the colours properly. Then once the sun came up our setting was back lit, so again it was difficult to see exactly what we were painting. We were up against a tight deadline to complete the work by 9 a.m. so it was a fast finish against the clock to adjust the colouring to match the then more natural daylight. Camouflage body painting can be incredibly difficult for the models as standing or sitting very still is a really important requirement. The veterans were all incredible considering some of their injuries meant that standing or sitting for prolonged periods caused a lot of discomfort! One of the most enjoyable things about my job is meeting so many interesting people and when you are painting someone for several hours you really get a chance to know them! From hearing stories about their families and how their injuries have affected them to Frank’s absolute love of Game of Thrones! Despite some of the hurdles that they faced on the painting days everyone was really up for the challenge! Getting a model with a great attitude makes a huge difference on a stressful job and I’m incredibly grateful for all the hard work these lovely men put into each day!!! I think the dedication and effort put in by the models and everyone involved in the campaign really paid off. 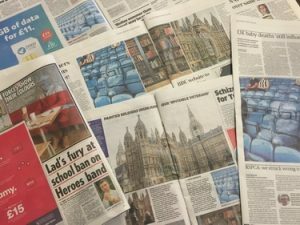 As soon as it went ‘live’ the campaign received a huge amount of press coverage, both in national newspapers where it was featured in The Telegraph, The Guardian, The Independent The Daily Star and numerous regional publications. We count on them – let’s count them in. People nationwide are being asked to show their support for the campaign and for more information or to support the campaign please visit the British Legion Organisations’ webpage here. ‘Naked and Invisible’ On Channel 4’s All4 Facebook Page goes viral!! The ‘Naked and Invisible’ series of short films for Channel 4 featuring my camouflage body painting has gone viral over the last week. Since its release 10 days ago the brilliant video has received more than 5.7 million views and has been shared an unbelievable 66,000 times all around the world. It’s been seen everywhere from Hong Kong to Buenos Aires and Venezuela to Nepal. I’ve worked on a lot of camouflage assignments during my career but this has to be up there as one of the most enjoyable jobs that I’ve ever done. So naturally I’m thrilled for everyone who was involved in the making of the series. The background to the series. As I said in a previous blog, I was approached by Showem Entertainment Ltd several months ago regarding an idea that they were working on for a series of short films for Channel 4. 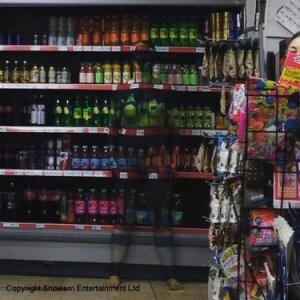 This would involve volunteer models being camouflaged, using body paint, into various backgrounds around London so that they were invisible to the public for a short while. 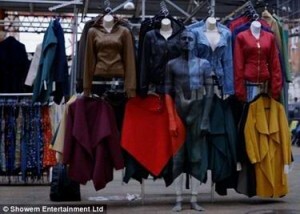 All the models had a particular reason for wanting to be invisible for a day. I really liked the concept and was very happy work on this project with the team. We started the series back in August last year with the lovely Leyah Shanks who is a body confidence blogger from Edinburgh. It was my job to blend her in to the back of a telephone kiosk in a London street. We then moved on to various locations around London and I painted Body Builder Kate Austin, Personal Trainer Ashley Lewis, Amputee Taylor Crisp, Alternative Model Alison Ward and Librarian and Drag Queen Matthew ‘Morgan Fabulous’ over the course of a week. Working on the production of the series was a great experience and the whole crew from Showem Entertainment Ltd were just brilliant. The very brave volunteer models who were completely new to the sometimes surreal world of body painting were absolutely marvellous to work with, and we had so much fun with the various scenarios. The reaction of the members of the public when they were ‘surprised’ by the models wearing their camouflage body paint and not a lot else was at times hilarious and so much fun to watch. 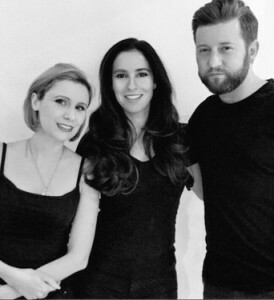 And finally I had some lovely testimonials from Simon Goodman the producer of ‘Naked and Invisible’ and also Laura Scimone who is a member of my make-up and body painting team, and who worked incredibly hard alongside me for a week whilst we were filming the series. A big thanks also to Emily Dowdeswell from my team who also assisted on the pilot for the series. Laura Sicmone, Make-up Artist/Body Artist. Around 6 months ago I was approached by Showem Entertainment Ltd regarding an idea that they were working on for a series of short films for Channel 4. In the shorts, models would be body painted into various backgrounds around London so that they were camouflaged and invisible to the public. I really enjoy camouflage body art so was definitely up for the challenge. The people that I painted had volunteered because they all had a particular reason for wanting to find out what it would be like to be invisible and it was fascinating to meet them and hear their stories. They were all marvellous to work with and very patient during the whole body painting process which can take several hours. I’ve painted literally hundreds of models during my career in numerous locations around the world, but it’s always very important that I put first-time models at ease and find a comfortable pose that they’re happy with. We started the series back in August last year with the lovely Leyah Shanks who is a body confidence blogger from Edinburgh. It was my job to blend her in to the back of a telephone kiosk in a London street. Leyah disappeared into the phone box and undressed. She emerged in her pants and I arranged her in a pose that she would be able to hold for the duration of the painting. 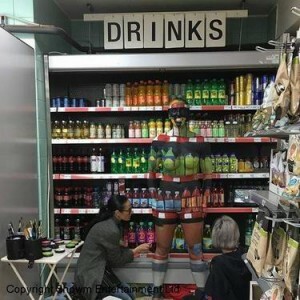 I was working with the talented Emily Dowdeswell and once the camouflage effect was finished we cleared away the painting equipment and left Leyah to surprise the public. Leyah was a brilliant model and absolutely loved the whole process and said ‘it was incredibly freeing to rid myself of all my clothes and underwear in a public place’. You can also read her account of the day on her interesting blog here. I also painted personal trainer Ashley Lewis from London. Ashley has an amazing physique so can stand out from the crowd and sometimes his physique attracts negative comments. He wanted to know what it would feel like to be invisible and NOT have people staring at him. I had to camouflage him into a fruit and veg market stall and had the lovely Laura Scimone helping me with the painting. Unfortunately, as we were working outside, we were beaten by the weather on our first attempt, so we had to relocate to an indoor shop with hilarious results once the painting was finished. Ashely’s experience can be seen here. Another fantastic model was drag queen and librarian Matthew whose alter ego is ‘Morgan Fabulous’ and he was definitely fabulous to work with. He gets mixed reactions from his clothes and make-up and would love to give other people the confidence to wear what they want to. Laura and I had to camouflage him into a coat stall in busy Spitalfields market. Listen to his story and watch is transformation here. Alison is a fully tattooed model from Bath. She was tired of being treated differently because of her tattoos and wondered what it would be like to be invisible for a day. So Laura and I camouflaged her into a stack of suitcases in a market. The main challenge was covering all of Alison’s beautiful tattoos and completing the body painting in such a busy market place. Watch the story unfold here. Taylor was born with a shortened femur and had her leg amputated as a child. She wanted to overcome her fear of having her scars on show in a public place. She was camouflaged into a busy café and once she removed her prosthetic leg she couldn’t stand for too long, so Laura and I had to make sure she was comfortable with her pose on a stool before we began the painting. Taylor was very apprehensive about the process before we began, but ended up enjoying the day and hoped that her experience might help others in a similar situation. I also had the pleasure of working with Welsh body builder Kate Austin. She has an amazing physique but it can leave her feeling self-conscious. 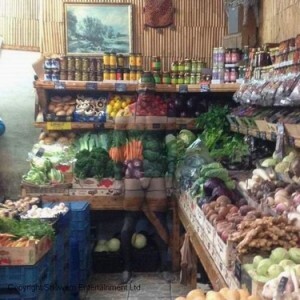 Kate wanted to see what it was like to be ignored so she was painted to blend in with some shelves in a supermarket. Kate was a pleasure to paint and I think she enjoyed the experience. The reaction from the shoppers was very funny! 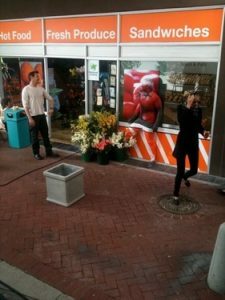 Watch Kate surprise the shoppers here. I’ve worked on a lot of camouflage assignments during my career but this has to be up there as one of the most enjoyable jobs that I’ve ever done. It was a great experience. Everyone from Showem Entertainment Ltd and all the brave volunteer models were absolutely marvellous to work with. We had a lot of fun with the various scenarios and the reaction of the members of the public when they were ‘surprised’ by the models wearing their camouflage body paint and not a lot else. It was all very funny! 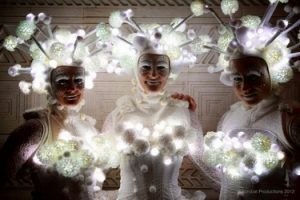 Festive make-up, twinkling body painting and the X Factor finale. On Friday the 11th of December I was delighted to be working with my colleague and Getmadeup team member Emily Dowdeswell at The Royal Albert Hall for ‘A Kylie Christmas’. This was Kylie’s first ever headline appearance at the venue to celebrate the release of her new album. Emily and I were responsible for the red sparkling hair and make up for Kylie’s dancers, and also her backing singers. It was great fun with wonderful backstage catering and a real party atmosphere to the whole evening. Every seat had a Santa hat on it, so the whole audience could join in with the festive fun. It was very hectic, but very enjoyable. Everyone was a delight to work with. On Saturday morning, whilst I set off for Wembley for the X Factor final weekend, Emily dashed over to ‘The Strictly Come Dancing’ studios to repeat the hair and make-up on Kylie’s dancers for that show. I had the pleasure of working on the Eastenders Christmas shoot for ‘Inside Soap’. I was responsible for the hair and make-up for the lovely Shona McGarty, whose character is Whitney Dean in the soap. There’s a very colourful and festive 4 page article in the magazine. I used Mehron Pro Celebre HD foundation to give Shona’s complexion a lovely radiant finish. Gold body painted models for ZEEN oil promotion at Fortnum and Masons, London. We recently had a booking for a team job for ZEEN Oil which is a Moroccan oil handmade by local Berber women in rural villages. The event was very early on a Monday morning where 5 models would be painted gold to promote the product at Fortnum and Mason’s. The taxis for models and artists were booked for 3 am. I wouldn’t get home from Sunday night’s X Factor until around 1 am, so there was no way I would be awake enough for the painting. Our very talented Getmadeup girls from my team, Emily and Alison, did an amazing job on our gorgeous models with some stunning make up and sparkling gold body painting using Mehron Gold Metallic powder. If this reminds anyone of the James Bond film Goldfinger and the urban myth surrounding gold paint….specialist metallic body paint that is cosmetic grade and FDA approved is actually completely safe to use on the whole body. Backstage at the X Factor with Chief Make-up Designer Julia Carta and Paul Merchant, Head of Make-up at Charles Fox – Kryolan UK. The 12th and 13th of December saw the final shows of this year’s X Factor. I’ve been a part of the make-up team for the contestants for the last 4 years, working under the X Factor Chief Make-up Designer, the celebrity make-up artist Julia Carta. It’s always exciting being involved in such a huge live show, there’s a lot of running around backstage with last minute touch up’s etc. We get to know the contestants really well in the make-up room and we’re sorry when they leave the show. This season was more condensed than previous years because of the Rugby World Cup and just flew by. It’s quite sad when it’s over and it’s time for our little team to disband once again. But it’s also a sign that Christmas and 2016 are just around the corner. 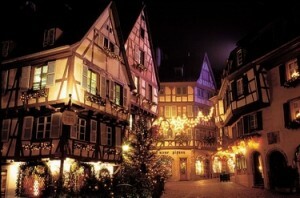 The Christmas Market at Colmar, Alsace. It’s been a great year here at Getmadeup. I’ve worked on so many diverse projects with rugby players, actors, celebrities, live body art installations and also TV shows. And my marvellous team of make-up and body artists who support me on larger assignments have been brilliant as always and great fun to work with. There’s lots more in the pipeline for 2016 and I’ll be sharing plenty of interesting, and hopefully useful information, about the sometimes surreal world of freelance make-up and body painting. 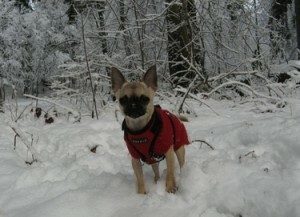 Merry Christmas from Lois, my furry companion, pictured here in the Black Forest, Germany. I’m spending the holidays in Europe and looking forward to visiting some of the beautiful Christmas markets in the Black Forest and The Alsace. So I would just like to wish all my Getmadeup girls and boys, clients, colleagues, family and friends a wonderful Christmas and a happy, healthy and peaceful New Year. My invitation to attend the Hollywood Premiere of ‘Dumb & Dumber To’. In 2013 I was the body painting artist for the camouflage scenes in the Hollywood movie ‘Dumb and Dumber To’ starring Jim Carrey and Jeff Daniels. So this time last year I had just got back from a truly memorable trip to Los Angeles for the World Premiere of the film. 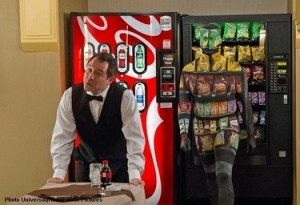 The vending machine camouflage body painting scene featuring Rob Riggle. I had to camouflage the American actor Rob Riggle into two different backgrounds for the film. One scene was set against a wall in a garden and the other one was the infamous ‘vending machine.’ The directors of the film Peter and Bobby Farrelly didn’t want to use any CGI, or any post production work. They wanted to film the scene exactly as had I painted it, so I knew the body painting had to be perfect. The vending machine design in particular was very intricate and Rob was incredibly patient whilst I took several hours to blend him into it seamlessly. When I had finished everyone was very pleased with the end results and when “wrap” was called at the end of the scene I was given a round of applause. It was a brilliant experience being on set for 3 weeks and meeting the cast and the crew and Rob was an absolute delight to work with. So I was thrilled when I was sent an invitation to the Premiere in November 2014. I flew to Los Angeles and stayed at the beautiful Beverly Hilton which is an iconic hotel where numerous major movie stars have stayed over the years. The walls were lined with black and white photos of famous past guests. The pool area was also reminiscent of a 1950’s film set. The weather was amazing with temperatures in the 80’s. On the Red Carpet for the Hollywood Premiere of ‘Dumb & Dumber To’. 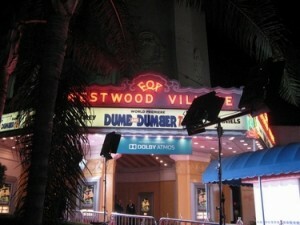 The Premiere was held at Westwood Village Theatre in Hollywood. It was very exciting arriving at the theatre with barriers on all the pavements and lots of security guys around. I definitely had to do the obligatory photos on the red carpet!! We made our way into the theatre and everyone was given tubs of popcorn and cola in the foyer before we sat down to wait for the film to begin. It was quite a surreal experience watching the film and seeing my work on the big screen. Watching the scenes where Rob was camouflaged was amazing. Seeing him hidden before most of the audience had realised and then hearing their reaction when he moved out from the background was great. When the film finished and the credits rolled my name was on the screen as the Make-Up Consultant. It was certainly my most unique cinema experience ever! 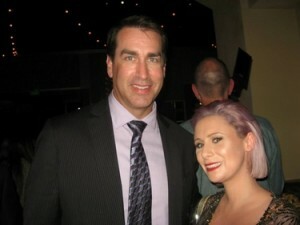 Posing with Rob Riggle at the ‘After Party’. Once the film had finished we all set off for the ‘After Party’ with the cast and crew. It was great fun and there must have been hundreds of people there spilling out of the venue onto the lawn. There was a lot of delicious food and it was great to meet up with some of the people that I had worked with on the film, including the lovely Rob Riggle. I would have loved to stay for longer, but all too soon it was time to leave the sunshine and return to London as I was busy working as a make-up artist on the X FACTOR as one of ‘Head Make-up Artist’ Julia Carta’s team for the contestants. I’m sure I bored them all to tears with tales of my travels. But I have to say it was an amazing experience and definitely the highlight of my body painting career so far! Westwood Village Theatre, Hollywood – the venue for the Premiere.